For the American comedian, see Billy Crystal. I’d rather fight than switch. It’s worth fighting. Isn't conservatism in part about resisting so-called new realities when you sense they might be questionable, even as people lecture you that you’ve got to get with the times? 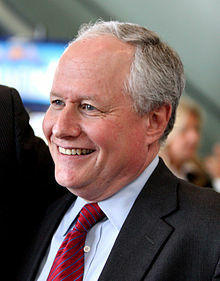 William "Bill" Kristol (born 23 December 1952) is an American neoconservative commentator. The Obama years have been weighed in the balance and found wanting. Severely wanting. By the end of Obama's presidency, the U.S. standing in the world was weaker—clearly and appreciably weaker—than when he became president. The force of American power was diminished, and freedom was in retreat. The present moment is not one to be proud of. The normal vulgarity of democratic politics has become the shameless demagoguery of democratic decadence. The routine operation of party politics has given way to the mindless polarization of partisan fanatics. The characteristic limitations of popular leaders have yielded to an abdication of leadership itself. A public life with occasional cringeworthy moments has been replaced by one that is on the whole cringeworthy. Well, Foley is responsible for it, and the voters in Florida, I guess, who elected him. Maybe they should have known better. It's not a serious document. I think Rumsfeld was not a good Defense Secretary. I'm glad he's gone. Barack Obama is not going to beat Hillary Clinton in a single democratic primary. I'll predict that right now. The Obama years have been weighed in the balance and found wanting. Severely wanting. By the end of Obama's presidency, the U.S. standing in the world was weaker—clearly and appreciably weaker—than when he became president. The force of American power was diminished, and freedom was in retreat. By the end of Obama's presidency, was there a single part of the world where the United States was in a stronger position than when he took office? Was there an ally who was more confident or an adversary who was less so? By the end of Obama's presidency, were any important countries either friendlier or freer than they had been when he took over? The answer to all these questions: no. Donald Trump is an embarrassment. It would be better for the country if he were president for at most one term. [T]he Islamic world is a source of danger and destruction is all too conceivable. Indeed, it’s been on display, in plain sight, for years... The jihadist threat is real, and it must, obviously, be fought and defeated. But that raises another problem—not a problem with Islam, but a problem with the West. We have lost our nerve. In recent years, the attitude of Barack Obama has prevailed over the spirit of Charlie Hebdo. The claims of sensitivity have trumped the attachment to freedom. Appeasement of jihad has supplanted the war on terror. Most fundamentally—let’s be honest—fear has overwhelmed courage. And so the American president has been happy to proclaim, as he did at the United Nations in September 2012, “The future must not belong to those who slander the prophet of Islam.” He has been less willing to say that the future must not belong to those who kill in the name of the prophet of Islam... We face a crisis of Islam. We need to be clear-eyed about that. But we also face a crisis of the West. Only if we come to grips with that second crisis will this period of consequences turn out to be an occasion for renewal rather than another marker on the path to decadence. So WE are to blame for the "bad blood" with Russia. Not what Putin has done in Ukraine, in Syria, in the UK, at home, or with respect to our elections. Amazing. We're to blame for the "bad blood." Not Putin. The real meaning of America First is Blame America First. [I]nstitutions are strong; it turns out you don't need a lot of sensible or even sane leadership in the White House. The town hall has the spirit of representative democracy, the rally of autocracy. The rhetorical extremism, the winking at violence, the reveling in vulgarity, and the embrace of amoralism are not bugs but features of Trumpism. Intellectual and moral coarsening is both a condition and a consequence of the demagogue's success. Trumpism really does corrupt. Younger people actually understand how it works. They don't just take what they are fed according to their preferences; they go look at other things. So I've always been more anti-baby boomer and more pro-millennial. Hasn't America really always been, at least since the middle of the 19th century, a majority-minority country? Lincoln, July 10, 1858: "We have besides these men—descended by blood from our ancestors—among us perhaps half our people who are not descendants at all of these men..."
[T]here seem to be more CRIMINALS in the Trump Administration than in the Caravan. Trump is the proximate, the efficient, cause of the collapse of the conservative movement. The principles of sound conservatism compel us to criticize him, to rebut him, to resist him, and to plan to overcome him. Have you ever met a war you didn't love? Our winner [of BEST Persons], the one and only William Kristol, still of The New York Times. His latest gem, after the Supreme Court struck down the Military Commissions Act and restored the Writ of Habeus Corpus to even the detainees at Gitmo: "The decision was wrong and our fears about the Administration's attack on the great writ are overblown, because American citizens have a right to Habeus Corpus, and anyone arrested in this country has a right to Habeus Corpus." Sadly, no! That's the problem! The Military Commissions Act specifically said there was to be no Habeus Corpus for non-citizens, even if they were arrested in this country. More importantly, Bill, if, under the Act, or whatever monstrosity McCain is backing to replace the Act, if they arrested you, William Kristol, and declared you a non-citizen and an enemy combatant, and you say, "But I was born in New York City," exactly where do you think you'll be able to prove that and get yourself released? At a court hearing — a court hearing that would never happen because there would be no Habeus Corpus, because the government said you weren't born in New York City, and your response would never - even - be - heard. The New York Times columnist, on the air: “I think Hillary Clinton was gracious, has put behind her the horrible sexism and misogyny the Democratic primary voters demonstrated, which I‘m appalled by, personally. Never would have happened in the Republican party.” Mr. Kristol is ignoring the public commentary by a prominent Republican on Fixed News on February 3rd of this year, who said the only people supporting Senator Clinton's bid for the presidency were, quote, “the Democratic establishment and white women.” Then this Republican added, quote, “white women are a problem. That‘s—you know, we all live with that.” Which Republican's horrible sexism did Bill Kristol forget? His own. All that was said by William Kristol, today's worst person in the world.